One of the most common complications for people with rheumatoid arthritis is eye problems, which can lead to corneal damage and ultimately impact vision if left untreated. You’re listening to Everyday Family Medicine, and I’m your host, Dr. Jennifer Caudle. Joining me today is Dr. Anne Negrin, an ophthalmologist practicing in the New York metro area. Dr. Negrin, welcome to ReachMD. Thank you, Dr. Caudle. It’s wonderful to be here. Well, we’re excited that you’re here. So why don’t we just start, if you want to just introduce us to you a little bit. Why don’t you tell me a little bit about your practice and the range of medical conditions that you see in your practice, both in and outside of ophthalmology? Well, I run a private, solo ophthalmology practice where we see a wide range of patients, basically from the cradle to the grave—healthy patients, patients with rheumatologic disorders, patients with blood pressure issues, diabetics and, of course, just your average patient who’s just coming in for their eyeglasses and their checkup each year. We are based in a suburb of New York City, so we really see a wide range of types of patients as well, and it’s really a pleasure to see these patients in their different stages of life and also following them concomitantly with their internist, really to make sure they’re getting their best care. This is Everyday Family Medicine. This is the show, and one of the things I really like to focus on and talk about is how family medicine or the primary care physician sort of intersects with the specialist, and so it’s nice to hear you talk about that sort of working relationship. And, of course, one of the goals of this show is to talk about conditions that generalists need to be aware of and need to be thoughtful about. One of our angles today is talking about how rheumatological conditions can present in your work as an ophthalmologist. Can you speak to that a little bit? We have a wide range of rheumatologic issues, whether it be patients who just have a positive ANA and they don’t have a discreet diagnosis but they have these vague symptoms. It might be a singular joint pain, and they have got this antibody. They’ll have vague symptoms in their eyes as well. We see that, and then we see all the way to people with full-blown Sjögren’s disease who typically, almost in all of them, present with severe dry eye. And then we see everything in between. We do see patients with lupus, children with juvenile rheumatoid arthritis who have uveitis or iritis and present with these symptoms in the eye, and more often than not, patients don’t realize that what’s going on in their eyes could have to do with what’s going on in the rest of their body, and so we often work with closely with other rheumatologists and internists to kind of figure out what’s going on with the patient. You mentioned a couple of the symptoms, maybe if we can just drill those down just a little bit more. You mentioned uveitis, iritis; you mentioned dry eye as some of the symptoms you see. Can you talk a little bit more about specific symptoms that a patient may have or ophthalmological diagnoses that may lead us to a rheumatological condition? What would that be for the primary care doc to kind of keep in mind or be thoughtful about? So, if you have a patient that’s describing, “Well, for the past couple of days, in one eye it’s been red, I’ve been photophobic, I just can’t go outside in the sun anymore, and I’m finding it very hard to focus”—and it’s usually in one eye; rarely it will occur in both eyes—you have to think about iritis or uveitis, which depending on where in the eye it is, is this nonspecific inflammation, and the ophthalmologist will be able to see in a slit lamp. You may have some discrete signs and symptoms also, though, that the internist would pick up on, and those are primarily a red eye, painful photophobia, and usually a diagnosis of iritis will warrant some sort of topical treatment with steroids, which we usually treat very, very short-term, tapering over a few days, rarely needing it more than a week, and then we have to look at the underlying cause as to why the iritis is going on. Another common symptom that we’ll see in the eyes, of course, is the dry eye, which tens of millions of Americans suffer from dry eye, and it is a spectrum. 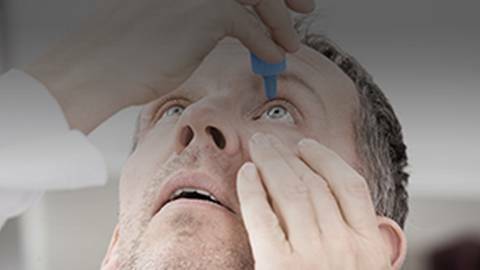 You have patients whose symptoms of dry eye are alleviated with just artificial tears on a prn basis, and then you have the patients with severe dry eye, which typically are patients with a rheumatologic disorder at the same time, namely Sjögren’s, lupus, even just rheumatoid arthritis, so those patients may have to be on a topical prescription drop that helps them make better tears— and not just treating their hour-to-hour or day-to-day symptoms with artificial tears but actually being on a prescription eyedrop that treats the underlying cause of the inflammation in the lacrimal gland, and those are the drops like Restasis or Xiidra, which you may have seen the commercials for now. And in general it’s the rheumatologic patients who need these drops, need the prescription drops, and do better with them. So knowing that they have an underlying diagnosis will help me in treating the dry eye as well. And then, of course, you also have uveitis, which can affect the back of the eye, creating severe retinal issues where you can have retinal inflammation and scarring, and at that point you’re concerned about the patient actually losing vision, so of course any patient that’s coming in complaining of a lot of floaters in their vision so they can’t see or a section of their eye where they have a blind spot that wasn’t there a couple of days ago, then we’re concerned about posterior uveitis, or uveitis involving the retina. There’s a number of other issues we see typically in rheumatoid arthritis. About 50% of rheumatoid arthritis patients in their lifetime will present with corneal issues, such as we’ll call it peripheral ulcerative keratitis, and what that really means is you have the periphery of the cornea, which is very vascular—the central cornea is not vascular—so all the way at the periphery you have these blood vessels depositing these inflammatory components, and what happens is the cornea actually begins to ulcerate, which is quite painful, obviously affects the vision. It will be unilateral. You often see a sectoral area of injection, so not the entire eye like you may see in a pink eye or if there’s a chemical conjunctivitis, but you’ll actually see a section of the eye that’s red, and with a pen light it will be very obvious. You may also see that the pupils are uneven, and that may be due to a traumatic or an inflammatory mydriasis in one of the eyes, so it really depends, but we have to think about this because it does happen. And especially, this last entity that I talk about, the uveitis, it can lead to scarring in the cornea, and as I said, it’s very, very common in the rheumatologic spectrum, especially with rheumatoid arthritis. If I can just ask a follow-up question about some of the symptoms that you mentioned: How quickly would those develop in a patient, a patient that’s complaining of, say, the uveitis symptoms, etc.? You mentioned dry eye. In a patient where the underlying issue is potentially a rheumatological issue—because that’s kind of our focus, right?—are these things that will develop over a long period of time? Are they more acute? How might that present in terms of timing to the primary care physician? Most of these issues actually are pretty acute with the exception of dry eye. Dry eye is its own entity unto itself because the signs and symptoms of dry eye can be itchiness, burning. It can actually be tearing, which is quite counterintuitive to patients and to even most doctors, but when you’re dry, you actually may tear because you’re not producing tears at the right consistency and the right components. Dry eye really is going to come over time. They may notice it gets worse later in the day. It is certainly worsened by screen time and screen use, which is an epidemic unto itself right now. But dry eye aside, the rest of these entities are pretty acute, meaning they just wake up with it one day or it’s the second or maybe even the third day and they really can’t take it anymore, whether it’s a red, painful eye, whether it’s blurry vision, or we’re talking about the back of the eye and we’re talking about floaters or blind spots. These are going to be pretty acute, and the patient is going to really be coming to the ophthalmologist in a lot of these cases because they can’t take it anymore. They can’t drive that day because the sun is too bright. They can’t do work on their computer because one eye is just so painful it can’t stay open looking at a screen. For those of you who are just tuning in, you’re listening to Everyday Family Medicine, and I am your host, Dr. Jennifer Caudle. My guest today is Dr. Anne Negrin. She’s an ophthalmologist practicing in the New York metro area, and we’re focusing on rheumatological concerns that ophthalmologists see in practice. Dr. Negrin, I’d just like to continue on. You’ve done a great job of discussing ophtho symptoms a patient might present with who actually has an underlying rheumatological condition. How often are you seeing rheumatological manifestations of eye sort of symptoms, and are there certain populations that maybe are at higher risk for these that you see in your practice? We’re seeing it more and more. I mean I think it’s more common than ever that we’re seeing eye conditions ranging from the typical dry eye to acute uveitis. We’re seeing it more and more in patients, and I think part of the reason is that we understand more now as opposed to 20 years ago that many rheumatologic conditions in the autoimmune spectrum as well exist. We never really diagnosed a lot of these before. I think the level of care wasn’t where it is right now. And I say the highest risk factor is your 40- and 50-year-old female. When I see a patient who comes in and no medical history, denies any medications, perfectly healthy but they’re coming in with this red, painful eye and they have iritis—it’s short-term and we treat it—I’ll give them one pass for an idiopathic iritis, but once they come in for that second—it’s happened again, it’s happened to the other eye, there’s no reason to think there’s anything infectious going on—well then they deserve a rheumatologic workup and be referred to a rheumatologist. And in my experience, it’s really females, middle-aged, who are most likely to be at risk for rheumatic disease. And beyond that, then we’re talking about children as well who often we don’t think about it. They may not complain about a unilateral, painful, red eye. Children, as we know, have a high tolerance for things, and they may not complain the way an adult might, and so a case of juvenile rheumatoid arthritis may frequently present with iritis in one eye, and so we have to remember that in the back of our head that this seemingly perfectly healthy child may have that. But besides that, I’d say the biggest group is middle-aged females, I think. They deserve to have a good workup to make sure nothing else is going on. You talked a little bit about management, and you mentioned with dry eye, sometimes which we see in Sjögren’s and other conditions, you mentioned the Restasis drops, etc., and some of the other conditions where we might use—or you might use as an ophthalmologist, rather—a short burst of steroids. Just so that our listeners kind of get a scope of the range of potential treatments for these ophtho manifestations of either autoimmune disease or other rheum diseases, what other types of treatments do you find yourself using for these conditions? A lot of these patients will have pain, and you’ll have them on oral ibuprofen if their GI system will permit, but some of these patients, especially if they have scleritis and it’s progressing, they need to be on oral steroids. And while I will certainly start a patient on an oral steroid, it’s at that point that I will send them for blood work, and I’ll often do that in a lot of my patients. Even if it’s not severe enough to put them on oral steroids, I will send them for a full rheumatologic blood workup, and at the same time, if I do feel like they need to be on oral medication or if there’s a relapsing condition going on in the eye, I will refer them to a rheumatologist at the same time that I see them for all of this blood work. Oral steroids is the mainstay. Even though we try to avoid it in the short-term in some of these patients, that’s really going to prevent the condition they have from becoming seriously sight-threatening. And at the same time, of course, you have the antimetabolites that the patients will possibly need to go on to control their rheumatologic disorder, but at the same time we find that that will help their ocular signs and symptoms too. It’s helpful to hear as an ophthalmologist your practice includes at times ordering the lab workup and in addition to sending them to rheumatology when you find that it’s necessary. I mean, you might be prescribing oral meds and possibly ordering the workup and sending them, and that’s, I think, helpful to know too as primary care doctors. What are some thoughts or recommendations that you might have for us generalists who may be seeing a patient with ocular symptoms like what you’ve described, or maybe even not? Any particular recommendations or things that you see that you would say, “Okay, maybe it should have happened this way,” or, “Maybe the primary care doc…” you know, it’s okay to do X, Y or Z? Well, I think the biggest helpful point would be to keep in the back of your mind the ophthalmologic manifestations of a lot of these diseases and that many of these patients don’t know that, don’t know that their eye symptoms could be linked to this, and so referring them out to an ophthalmologist is a great first step. Being able to be examined with a slit lamp and be dilated is really important for these patients to have a good look at their retina. Even if it’s a normal exam, should you have especially retinal issues down the line from their condition, at least they have gotten a baseline exam with their ophthalmologist, so I think first and foremost, remembering that they need to be plugged in with an ophthalmologist is important, and then at the same time, keeping in touch with their ophthalmologist. A lot of these patients, if the rheumatologist is going to put them on steroids, especially long-term, they need to be plugged in with on ophthalmologist to be monitored for glaucoma. High pressure in the eye can come from steroid use as well as premature cataracts, so that’s important as well just to have them plugged in with somebody who can take care of them. I think that’s a good reminder, absolutely. This was so, so helpful. Before we close, is there anything else that you would like to add? Well, I just think this is a wonderful opportunity for primary care providers to understand that the eyes are not separate. They are part of the body. They have a lot of serious side effects in many of the autoimmune spectrum and the rheumatologic spectrum, and as we’re learning more about it and seeing how patients react to treatments and respond, I think we’re going to be providing better care if we work together, and I think this topic is great and really important. Dr. Negrin, thank you so much for joining me today to talk about the connection between rheumatology and ophthalmology. Thank you so much for being here. I am your host, Dr. Jennifer Caudle, and to access this episode and others from Everyday Family Medicine, please visit us at ReachMD.com to Become Part of the Knowledge, and thank you for listening. Dr. Anne Negrin elaborates on eye conditions an RA patient might present and how proper care coordination leads to better management. Since eye issues are becoming increasingly common in patients with rheumatological conditions, it’s now more vital than ever that physicians are aware of their common symptoms. Joining Dr. Jennifer Caudle is Dr. Anne Negrin, an ophthalmologist in New York, to break down these symptoms and to focus on rheumatological concerns that ophthalmologists see in practice.